Over the winter months, I recently got the opportunity to dig into this amazing book! I had been feeling the need to get back to my artistic roots and my brother recommended this book to me. I am glad he did! It was one of the most thought-provoking books I have ever read about what it means to create and what it means to be an artist. 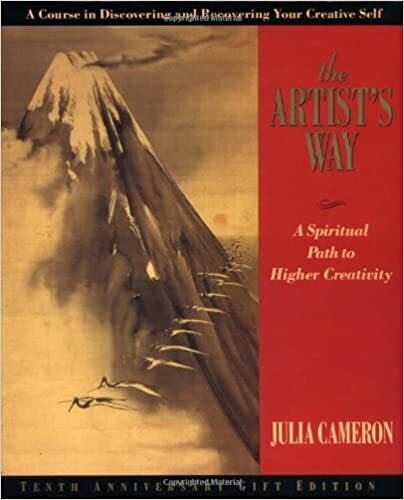 This book is written by the novelist, playwright, poet and overall artist, Julia Cameron. It’s a twelve week course in book form designed to help you uncover what is blocking you as an artist. Whether that be lack of resources, confidence, money, time, encouragement, or something else, Julia helps you identify and deal with each issue in a positive way. She first establishes the understanding that to create is what we were created to do. Each of us is an artist in our own special way. This book is a twelve-week course and it is suppose to be read and practiced over a three month period in a hands-on way. I didn’t have that time and so I simply read through the book 🙂 I still gleaned a whole lot of understanding and inspiration and a new found desire to create in the way that God wants me to. There are several ideas and concepts that Julia repeats over and over again that are really worth thinking about and possibly implementing in our lives. For example, two of the overall prevailing concepts in the book are the use of morning pages and artist dates. Morning pages are a sort of stream of conscious artistic journal designed to help you release the need for perfection and get down to what is really going on underneath. Artist dates are just like they sound! The chance to take yourself (the artist) out on a date to do something that you love and will help you find the hidden talents you have or practice the ones you love like painting, sculpting, cooking, landscaping, singing, etc.